Michelin North America, Inc. (“Michelin”) is proud to announce the annual Michelin Challenge Design to celebrate, promote, publicize and give visibility to original creative thinking and innovation in vehicle design. By embracing and supporting design, Michelin aims to establish a closer relationship with the design community, combining technical innovation with transportation design to create vehicles that consumers want to buy and will enjoy driving. Michelin challenges the international design community, individuals, small and large companies and universities, to enthusiastically create innovative and aesthetically pleasing design solutions that will meet the theme requirements of the Michelin Challenge Design 2018. Originally created as work vehicles for farmers, contractors, and delivery; pickup trucks have evolved to provide growing appeal as open bedded personal vehicles for an increasingly wide range of users. 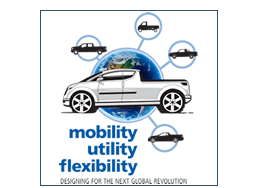 Today, changing lifestyles, work needs and economics are creating greater opportunities for pickup designs in varying shapes, sizes and capabilities to meet these growing new market segments around the world. 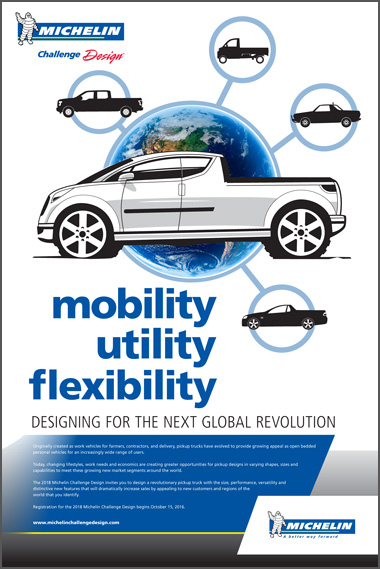 The 2018 Michelin Challenge Design invites you to design a revolutionary pickup truck with the size, performance, versatility and distinctive new features that will dramatically increase sales by appealing to new customers and regions of the world that you identify. What makes your design revolutionary? What innovations have you incorporated into your design? What region of the world have you chosen? Why? How will your design appeal to them and what needs does it recognize? Entry Form begins October 15, 2015. Registration/Entry Form available from October 15, 2016 through June 1, 2017. Design Image Submission available from October 15, 2016 through June 1, 2017.